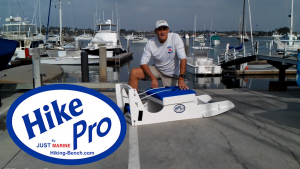 The Hike Pro revolutionizes hiking bench training by providing a dynamic hiking workout which closely emulates sail training in a dinghy on the water. Even if you can't launch your dinghy for every opportunity to train, you can easily hop on the hiking bench and build those hiking muscles! Read up on the hiking bench, see photos, watch the video and buy below. Feel free to contact us with questions, or post your comments below. Get better results for less than a new sail! This entry was posted in training and tagged video by Philip Thompson. Bookmark the permalink.